A person who has suffered personal injury from being involved in an accident may ask, “do I have a case?” or “what’s my case worth?” Initially it is very difficult to know precisely what a case may be worth, that is, what would be reasonable compensation for one’s injuries. There are many factors that affect what might be reasonable compensation. The goal is to compensate the injured person as far as money can do so. This places the cost of those damages on those who have caused the harm. Full compensation is important to deter unsafe conduct and place the cost of the harms and losses on those who have caused the injury. Otherwise, society is left to bear the cost. A personal injury or accident case will usually undergo a process that can take roughly 1-4 years to complete. No two cases are exactly the same. Over the course of a personal injury litigation many things can happen to affect the value. The injury may develop and get better or worse. Further treatment or surgery may be required. Discovery and investigation will be conducted that can uncover facts and information that will have an impact on the injury case. Personal injury and accident laws can also change over time. Motion practice can affect the viability of personal injury claims. Corporations and others that break public safety rules and cause injury and damage need to be held accountable in a civil trial in order to place the cost on them and make the public safer. In most personal injury cases the defendant will be covered by liability insurance that will pay for their lawyers and any settlement or jury award to the insurance limits or beyond in a Rova Farms situation. A compromise on damages is a compromise on danger. The law does not provide the jury with any table, schedule or formula by which a person’s pain and suffering, disability, impairment, loss of enjoyment of life may be measured in terms of money. The amount is left to the sound discretion of the jury based upon the individual’s judgment and experience. However, full and complete compensation is necessary to deter future harmful conduct. Otherwise, the defendant will be given a pass on the danger it caused, others will repeat it, and the community will be made less safe. Generally the more a case has developed the better a personal injury attorney will be able to gauge a reasonable value of your case. However, no attorney can honestly 100% guarantee a successful recovery. There are simply too many factors that can affect the outcome. Once your case has developed however, the experienced accident case lawyers at the Clark Law Firm, PC can compare the facts and circumstances of your case with verdicts and settlements of other similar cases to get an idea of potential settlement or trial value. 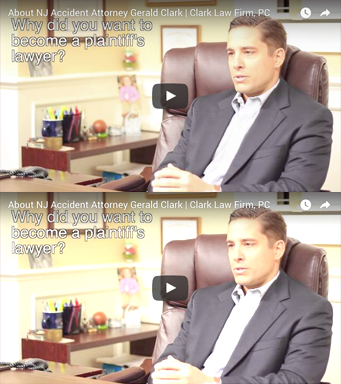 Clark Law NJ, New Jersey accident and injury law firm will assist you in deciding whether or not to accept what the insurance company may offer to settle your case. For illustration purposes, below is a list of personal injury case verdicts and settlements which may be helpful in estimating the reasonable value of a personal injury case. These illustrations may be a useful tool in answering questions such as, “what is my case worth?” “what should I settle my personal injury case for?” “should I accept the insurance settlement offer of my personal injury case?” “how much should I ask for in my personal injury case?” and other similar questions. No two cases are the same and one result in a prior similar case can not guarantee the same result in another. Animal Attack Verdicts and Settlements – cases where personal injuries have been sustained due to animal attacks or the negligent handling of animals. New Jersey Asbestos-Mesothelioma – Workplace Exposure Cases– cases where workers have contracted the devastating lung disease known as asbestos, mesothelioma, lung cancer and other similar workplace exposure injuries. Burn Injury Verdicts and Settlements – cases where people suffered burns of all different types- first / 1st degree burns, second / 2nd degree burns and third / 3rd degree burns due to the alleged negligence of others. Construction Accident / OSHA Violation Verdicts and Settlements – read about what other cases settled for or trial outcomes where people suffered personal injuries as the result of construction workplace accidents including scaffolding collapses, falls from ladders, iron workers, carpenters, plumbers, framers, masons, electricians, laborers, operating engineers, and others. These include trench collapses, cave-ins, demolition accidents, structure failures, accidents involving bulldozers, excavators and other heavy equipment. Dog Bite / Vicious Canine Cases – cases where people suffered lacerations, mauling and other injuries occasioned by attacks from vicious dogs. New Jersey has a dog bite statute which holds negligent dog owners strictly liable for these types of dog attacks. See what verdicts or settlements insurance companies who cover these cases have been liable to pay. Explosion or Electrocution Accident Verdicts and Settlements – mishaps involving encounters with electricity, explosive items including flammable materials, HAZMATs, gasoline and other hazardous activity. Learn about the arguments and legal issues in explosion or electrocution cases. Fall Down / Trip and Fall / Slip and Fall Accident Verdicts and Settlements – fall down cases of all types including defective sidewalks and walkways, potholes, supermarket fall downs, poorly maintained areas including poor lighting, tripping hazards, and other dangerous public areas that violate building codes and other safety standards for the safety protection of people. Learn about the various general liability insurance companies that cover these cases and the arguments their attorneys make to deny compensation to the injured person. Motor Vehicle / Automobile / Car Crash Verdicts and Settlements – car crashes, negligent driving and other cases involving personal injuries sustained in motor vehicle accidents. See the outcomes on other New Jersey auto mobile accident cases and the tactics used by the insurance industry to deny compensation to auto accident victims. Motorcycle Crash Verdicts and Settlements – lawsuit cases where people suffered serious personal injuries while riding motorcycles. Spinal Cord Injury / Paralysis Verdicts and Settlements – cases involving injuries to the spinal cord caused by spinal cord trauma including from car accidents, swimming accidents, stroke, work related and other types of accidents. Cases seeking monetary compensation for injury, pain and suffering, hospital costs, doctor bills, and loss of wages. Cases with different levels of spinal cord injury, some resulting in temporary and long-term paralysis including quadriplegia, paraplegia, hemiplegia, motor difficulties, bowel difficulties and sexual and reproductive difficulties along with the physical consequences of spinal cord injury. Traumatic Brain Injury Verdicts and Settlements – examples of traumatic brain injury (TBI) or mild traumatic brain injury (MTBI) cases including head injury, loss of consciousness, loss of memory and focal neurological deficits and damages to brain stem, frontal lobe, and temporal lobes, post concussion headaches, cranial surgery, cognitive, physical, and psychological deficit cases caused from situations where the head strikes an object. Determining the Value of Your Settlement – Arrival at a final settlement figure is a complex process that begins early in your meetings with your lawyer. After your attorneys have reviewed and investigated your case, they will discuss your potential for recovery with you. You are then free to offer your understanding of what your case is worth and the settlement range within which you are comfortable. As the client, you control the outcome of your case and if a settlement offer is not to your liking, your lawyers will swiftly decline the offer. Factors that Affect Case Value – As your NJ personal injury lawyer will tell you, many factors are involved in the value of your personal injury case. It is important to understand what the case value is so that you may properly evaluate a settlement offer once it is presented.